Windows Communication Foundation (WCF) is a new framework which was introduced in 3.0 .NET framework.It is framework which is used to build service -oriented applications in .NET. WCF supports unified programming model (framework).we can easily build secure reliable and integrated application across various platforms. Web services is used to provide interoperability but WCF can used to provide interoperability as well as other programming models.You can know more differences between web services and WCF from here. There are some main terms of WCF services in .NET. This attribute must be specify about that type which will provide service to the client application.That service type can be interface or class. This attribute must be define about that method which has to be exposed to the client application. If there is a type (class ,structure or Enumeration) which will be a return type or parameter type for the service method.Data contract attribute must be defined about that type and Data Member must be defined about variable of properties of that type. 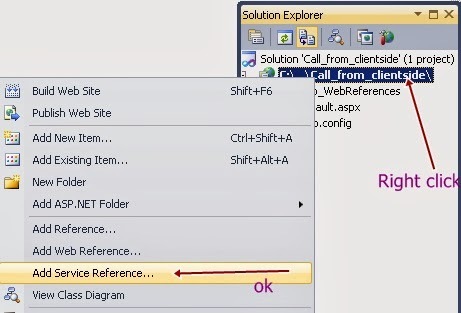 Step 1:-First open your visual studio --> File -->New -->Website-->Select WCF Service as shown below -->OK. // NOTE: You can use the "Rename" command on the "Refactor" menu to change the interface name "IService" in both code and config file together. Note:- In this file we declared the methods and variables of many services ( ex. rect_area , multiplication etc) .You can use it according to your requirements. // NOTE: You can use the "Rename" command on the "Refactor" menu to change the class name "Service" in code, svc and config file together. Note:-In this file we have defined the methods and variables which are already declared in Iservices.cs file.We have used this for security purpose. You change the file name (Iservice.cs , Service.cs) ,which is mentioned in above codes. Step 8:- Now Paste the URL which i have copied in step 5 -->Now press Go Button -->Select Services as shown below-->press OK. Note:- Here I have used WCF services in asp.net website.